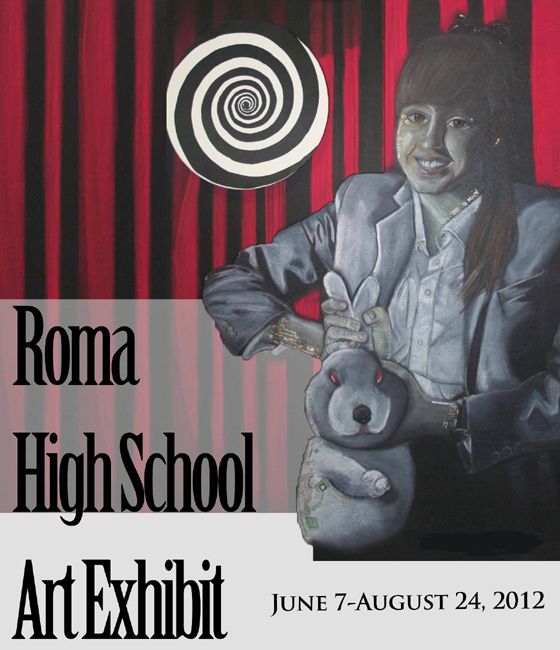 South Texas College’s Starr County Campus Library Art Gallery is proud to present its “Roma High School Annual Art Exhibit.” The show features works of art by students who have studied under the tutelage of Roma High School art instructors Monica Gillette, Mario Godinez and Gabriela Gonzalez. The exhibit is on display from June 7 to Aug. 24, 2012 at STC’s Starr County Campus Library located at 142 FM 3167, Bldg. F in Rio Grande City. Admission is free and open to the public. The exhibit features mixed media artwork by freshman, sophomore, junior and senior Roma High School students including Brianda Salinas, Kassandra Martinez and Anahid Cab. South Texas College’s Library Art Gallery Program exhibits regional, national and international artwork, explores new visions and theories of creativity, and introduces innovative artistic expressions to the South Texas region. For more information contact Dawn Haughey at 956-872-3488 or libraryart@southtexascollege.edu, or visit http://lag.southtexascollege.edu.